“The Holiday Survival Cooking and Eating Class exceeded my expectations. It was so enjoyable to learn new ideas for healthy snacks and meals, taste the delicious treats we created and leave with an inspired hope that this will be my healthiest holiday season yet! I am impressed with the knowledge and care that Robin (and Wendy from In the Kitchen) both possess and I look forward to taking more classes in the future. Thanks again!” –Rose M.
“I found the class delightful with great ideas for the holidays. In the Kitchen is a warm and welcoming place and you and Wendy were great teaching collaborators. Good new recipes. I appreciate your healthy eating information. I recommend this class to anyone wanting to enjoy the holidays without stressing over food. Actually, the information isn’t just for the holidays. I want to stay healthy all year and eat well.” –Pat B. 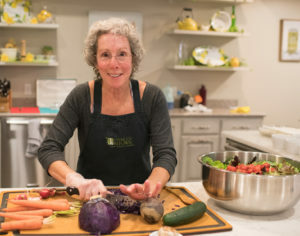 “I’ve participated in several classes at In the Kitchen, enjoyed them all immensely, but it is always a special treat when Wendy teaches a class. The recipes offered in The Holiday Survival class were easy to make and so delicious. And what a plus to have Robin co-teach the The Holiday Survival class with Wendy. Thank you, Robin, for all your great information on healthy eating, which was delivered so professionally, dovetailing beautifully into Wendy’s presentation. Hope you two team up again for more classes of scrumptious, healthy recipes. What a fun evening! !” –Carol B.
I love this positive feedback! How gratifying it is to touch the lives of others in a meaningful way…and to be able to do so around a topic that is so dear to me, is just the icing on the cake (right—pun intended!). Wendy Van Wagner and I will continue to offer seasonal cooking classes in addition to the occasional specialty class…stay tuned! The demanding schedule of the busy professional may not include foods that support optimal health. Eating well does not take an excessive amount of time and can be realistically incorporated into even the busiest calendar. Real food nourishes the body and the mind, benefiting physical and emotional health and well-being. Processed and fast foods do not support optimal health and are associated with an increased risk for diabetes, coronary disease, and cancer—just the opposite of real foods. Planning ahead to increase your access to real food takes about an hour per week and is a totally worthwhile endeavor! Begin in the grocery store. If you are not already doing so, stock up on whole foods, which are real foods that have not been processed in a laboratory. Real food does not have high fructose corn syrup, partially hydrogenated oils or food coloring added. If the food contains grains, they are whole grains as opposed to refined grains. Knock yourself out on fresh fruit and veggies, bring home new grains such as quinoa or barley and unusual beans like cannelloni or garbanzo, and consider feta cheese, pine nuts, red peppers and eggplant… Give yourself at least 4 weeks of subtle change in your grocery store purchases to become familiar and comfortable with the unlimited possibilities! Next, identify a time during the week that you can set aside one hour. Dial in your favorite classical music station. Now the preparation begins. Put up a pot of boiling water for the grain of the week, and another for the beans or legumes. A disclaimer here: I am a big fan of canned beans—they are easy to use, there is a huge variety to choose from, and they can be purchased with low salt or no salt content. Slice the peppers and eggplant, brush with garlic infused olive oil, and broil for a few minutes on each side. You can broil all sorts of veggies using this method, by the way; zucchini, asparagus, cauliflower, potatoes, carrots, beets, and many more! After the veggies have cooled, place them into a storage container where they will last several days in the fridge. Store the cooked grains and/or beans the same way. You are ready to move on to raw vegetables. Chop up broccoli, cauliflower, purple and green cabbage, carrots, and celery; wash, dry, and tear up good quality lettuce, arugula and spinach (or buy it bagged and pre-washed). All of this can be stored in the fridge and at a moment’s notice can be thrown together for a salad or a stir fry. Add a chicken breast, sliced tempeh, or piece of grilled ahi, and you’ve got a yummy and healthy lunch or dinner! The dough has just gone into the warmed oven to rise over the next couple of hours, when it will then be transformed into a fabulous calzone dinner. It’s been a while since I have made this dough, you know how it is when certain recipes just fall out of your repertoire. But once I got my hands into the mix and began to knead to my heart’s content (pun intended! ), I immediately dropped into a place of mindfulness and remembered…ah, how fabulous is the rhythm of kneading dough–and of creating a dinner made with love and healthful ingredients. Kneading dough invites a wonderfully rich experience when the change in consistency from a sticky mass to the aromatic, plump, almost sensuous, ball-of-dough-that-will-soon-become-dinner is occurring right under my own hands and nose. I felt in tune with the organic ingredients, with the movement of my hands and body (and yes, kneading is a full bodied activity! ), and with the sound of the dough catching and grabbing on the wooden board. In those few moments of mindfulness, I felt gratitude for my love of cooking, for having the healthful ingredients in my pantry, and for the sheer pleasure of the artful creation that will nurture and nourish my family. On the second Friday of the month, a group of volunteers meet at the Briarpatch Community Room to discuss, plan, create strategies, and share their enthusiasm for introducing, reinforcing, and supporting locally grown and sustainably cultivated foods into our county schools. I am honored to be a new member of this Food and Nutrition Action committee. Much has been accomplished in the nearly two years of the committee being in existence. And so much more needs to be accomplished…which in no way reflects the energy of the committee, but more so the common government/county agency logistic and implementation challenges that arise. Not that it slows down this group–they persevere, brainstorm, research the successes and the work of other counties, and cheerfully maintain forward motion with their mission. This intention of enhancing the health of our community, and of the planet, by connecting local farmers to schools, planting organic gardens on school campuses, facilitating assemblies for the students to cook/taste/understand locally grown foods and the benefits of sustainable agricultural practices, is a noble intention, indeed. As our entire country is making small steps towards eating well, Nevada County is enjoying the benefits of the many dedicated volunteers on this committee, as well as those involved in other county projects that support eating real food. If you have a chance, consider volunteering: the school closest to you will either have a garden already or one is in the works to be planted–even if you don’t have a child attending school–jump in to support our next generation in Nevada County. Do you think of the holidays as a food free-for-all time? Is it possible to enjoy, yet survive, holiday eating? Can you maintain your commitment to optimal health through the holidays? YES! With a little forethought and awareness, you can eat well, eat smart, and enjoy the holidays. These sensible tips are my (early) holiday gift to you. Eat 5 small meals per day. This approach to food is recommended to maintain efficient metabolism and minimize hunger, allowing for healthful food decision making. You know what happens when you become ravenous—you will eat any and all food put in front of you! Choose from the plant foods. The carbohydrates from whole grains, beans, legumes, vegetables and fruit are filling. They will take up room in your stomach, perhaps diminishing the chances of choosing high fat or processed foods. Not to mention the many physical health benefits of eating plant foods, such as antioxidant, fiber, mineral, and vitamin properties. Drink plenty of water. Water can be filling, which may diminish hunger and allow for healthful food decision making. You can dilute juice drinks with water, to lower the amount of sugar and calories you take in. If you are partying, I recommend alternating water with alcoholic beverages to prevent overdoing the alcohol as well as to decrease the amount of simple carbohydrate and calorie taken in (and minimize the morning after headache…). Nibble on a healthy fat, 10 minutes prior to sitting down to a meal or leaving for a party–this will activate the brain’s satiation hormone. Examples are 1 ounce of nuts, ¼ avocado, a half-container of yogurt, or 1 tablespoon of peanut butter; the richness of the fat, as well as the time it takes to digest, will displace the feeling of hunger and allow for healthful food choices later. Plan ahead to balance your food intake for the day. If you are going to a party in the evening, choose well for your two earlier small meals and small in-between-meal snacks. If you have had an indulgent family holiday breakfast, eat lean and light for the remainder of the day. State a positive affirmation prior to arriving at the party or family dinner. Consider “I will honor my commitment to my health and eat mindfully and healthfully” or ”I intend to enjoy small tastes of my favorite foods”. Positive affirmations are very powerful and will influence the outcome of your choices. Arrive with a success strategy, which will allow you the permission to splurge, but to do so with intention and awareness. Know ahead that you will likely be enticed to eat rich foods: casseroles, cheeses and meats, dips, cocktails and wine, and tantalizing desserts, to name a few. Repeat your positive affirmation statement! Eat with confidence! There is no need to deprive yourself! You might however, cruise the buffet table before taking a plate, and decide what will go on your plate–enhance the opportunity for choosing wisely. Use a small plate, and take small tastes of several well-chosen foods. Bring a healthy dish to share–you know you’ll have at least one healthful dish to choose from! Egg nog and punch or any beverage with alcohol, when consumed sensibly, are perfectly reasonable holiday choices. If you have 2 generous portions of egg nog however, you might consider modifying the food choices you make later in the evening, or better yet, have a couple of small sips of egg nog, eat well at the party, and enjoy a glass of red wine with your meal! Move away from the buffet table. This will minimize the temptation to keep nibbling. Keep in mind this formula: standing + talking + laughing + nibbling = overeating. Sit down to eat. Eat slowly. Savor each bite. Wait at least 15 minutes before selecting dessert. This strategy will allow time for your brain to catch up with your stomach. You might get lucky and realize that you are not hungry for dessert! If you do have dessert, take a small piece(s) of whatever you choose, and eat it slowly, savoring the flavor. Brush your teeth! After you have eaten slowly, and have enjoyed each bite on your small plate, excuse yourself to the bathroom. You will change the flora of your mouth and feel less inclined to eat more food. This works! Cultivate a mindful practice to balance holiday activity and stress. Find alternative self-soothing techniques such as intentional relaxation or regular physical activity.